Enterprise Architecture: A tool to use not a document to file. An Enterprise Architecture, by the time is becomes useful to the business, has consumed considerable time and effort to develop and populate. Often the principle deliverable of an Enterprise Architecture specific or Transformation Project the transition to a ‘Business As Usual’ scenario, where the tool is actively used, after project end, is the point where ‘things’ usually become unstuck. As a project deliverable the Enterprise Architecture may be expressed, for communication purposes, to those approving it, as a document. Once approved and the project wound up the document is often consigned to a shelf and the project team members, who created the Enterprise Architecture, assigned to other work. 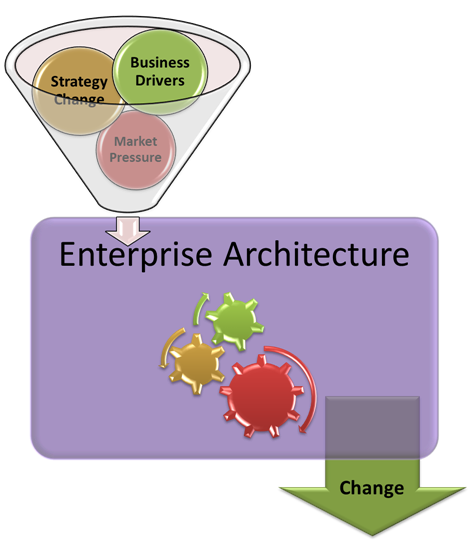 An Enterprise Architecture is not an end in itself. It is not something that once ‘completed’ should be placed on a pedestal with the message ‘Look what we have!’. Unless used, it is worthless. Designed as a tool to assist the business an Enterprise Architecture, along with rigorous processes defining its use and a governance regime ensuring that its content is as complete as possible, is accurate and is current, provides significant benefit when confronting situations that provide a compelling event that ‘demands’ business change. The Enterprise Architecture is designed to be both responsive to perceived change and proactive to anticipated change events. This allows to business to efficiently change, mature and grow in a positive way rather than possibly lurching from crisis to crisis which can happen without having an Enterprise Architecture available. As a tool, an Enterprise Architecture can be, to accommodate well defined scenarios, provided with a variety of relevant inputs which, through analysis, can assist in the definition of possible actions involving business change. The scenarios can range from a change of business strategy, resulting from perhaps market pressures, or new or amended legislation to perhaps a desire to mature business processes through asking ‘what if’ questions and assessing the impact. Whilst not a ‘machine’ that automates the process of making business decisions an Enterprise Architecture can, if used properly, assist the process, potentially resulting in faster and more beneficial outcomes.